The research of this dissertation was entitled Tarekat As a System of Sufism Education (The Moral Study of the Education System of the Qodiriyah Wa Naqsabandiyah Congregation in Ogan Komering Ilir District). This is motivated by the growth and development of a desire for spiritualism or Sufism in society in the form of tarekat teachings. The teachings of Sufism which were once exclusive and individual can only be learned by special people. In its development the tarekat underwent a shift so that it was inclusive and communal / group that could be learned by all Muslims. The growth of Sufism Majlis became the embryo of the formation of non-formal institutions of Sufism namely tarekat. Qadiriyah wa Naqsabandiyah (TQN) is one of the Sufism educational institutions which consists of educational components that work systemically. So the formulation of the problem is how morality in the spiritual education system of the Qadiriyah wa Naqsabandiyah Order includes aspects; Educational Objectives, Educators, Students, Educational Processes, Curriculum and evaluation.This research is a type of field research (Field Research), while the research approach that I use is the Phenomenological approach. This research includes descriptive qualitative research. In collecting data, the authors used primary and secondary data sources, namely murshid tarekat, students, provincial and district JATMAN administrators, and tarekat guidebooks. Data collection techniques are interview techniques, observation, and documentation. 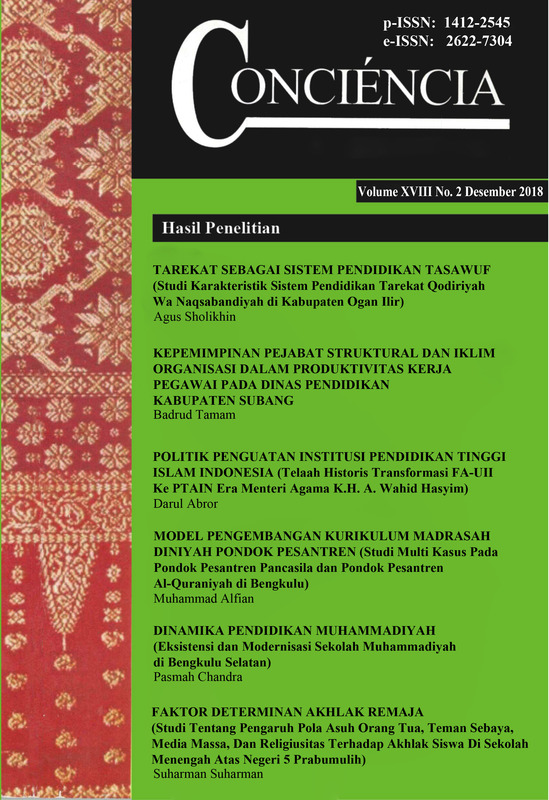 After the data is obtained, then it is analyzed using the descriptive-qualitative method with the technical data collection, data selection process (data reduction), data assessment, and conclusion drawing.This study found that in the Qadiriah Wa Naqsyabandiyah Ogan Komering Ilir Congregation, there are educational components that work systemically, including: Educational Objectives that have a moral characteristically Effective Ritualist, become an Al'Abid al Kamil, a moral educator (Teacher Centered ) being the main controller in education, students who have the morality of Resignation Religion, namely surrender fully / have a strong belief in spiritual guidance given by murshid (Rabithah and Wasilah). The Education Process that has an Akhlakistik Religious Internalisation, namely internalizing religious values ​​through Dhikrullah (Dzikir Darajah and Khasanah), and with the method of Mujahadah, Muraqabah, and Musyahadah. The curriculum which has the morality of the subject of Eksperiance Oriented is oriented towards the spiritual experiences of students through the Amaliah and the teachings of the TQN ((Aurad Dhikr, Tawajjuhan, Khataman, Shalawat, Istighasah and Manaqiban). Evaluation that has an akhlaqic Collegial Personal in the sense of institutional evaluation and individual (personal) evaluation in terms of the spiritual / inner condition of the student through isyarah murshid.With the findings above, the most important contribution in this research is Practically, this dissertation shows that the existence of the TQN tarekat institution in Kab. Ogan Komering Ilir is one of the Islamic Religious education institutions that focuses on the spiritual formation of the community so that it is able to create positive community morals in the face of the swift currents of globalization / modern civilization values ​​in the present.